Orange County prosecutor misconduct: Judge Goethals takes district attorney office off Scott Dekraai case. A defense attorney uncovers a brazen scheme to manipulate evidence, and prosecutors and police finally get caught. 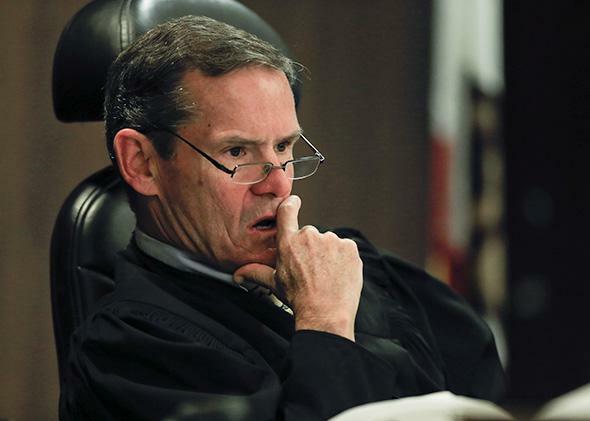 Judge Thomas Goethals listens to arguments during a motion hearing in the trial of Scott Dekraai on March 18, 2014 in Santa Ana, California. Prosecutorial and police misconduct are often dismissed as just a few bad apples doing a few bad apple-ish things. But what happens when it’s entrenched and systemic and goes unchecked for years? That looks to be the case in Orange County, California, where the situation got so completely out of hand this spring that Superior Court Judge Thomas Goethals issued an order disqualifying the entire Orange County District Attorney’s Office (that’s all 250 prosecutors) from continuing to prosecute a major death penalty case. After literally years of alleged misconduct involving jailhouse informants, as well as prosecutors’ repeated failures to turn over exculpatory material, Judge Goethals determined in March that the office can simply no longer work on the case of mass murderer Scott Dekraai, who pleaded guilty last year to killing his ex-wife and seven others at a beauty salon in 2011. Revelations of misconduct in the Dekraai case have raised questions about patterns of obstruction and deception that have unraveled various other murder cases in the county, which has a population larger than that of 20 different states. Other cases involving informants who were eliciting illegal confessions have emerged, entire cases have collapsed, and more may follow. The story goes way back to the 1980s, as R. Scott Moxley explains at length in the OC Weekly, to a prosecutorial scandal that ended in the execution of one defendant and a lengthy sentence for his alleged co-conspirator. Their convictions were based on the testimony of various jailhouse informants even though they told conflicting stories. That scandal rocked the area then, and this new one shows eerie parallels. All this is happening right up the road from Los Angeles, home of one of the most massive jailhouse informant scandals in history. In 1989, in an infamous interview with 60 Minutes and an explosive piece in the Los Angeles Times, former jailhouse snitch Leslie Vernon White demonstrated how he fabricated the confessions of other inmates, then leveraged them for reduced sentences. The White revelations led to a grand jury investigation that revealed that jailhouse snitches often lied, and that police and prosecutors—knowing they were lying—used them anyhow. L.A. has since enacted significant reforms of its jailhouse informant policies. Not so Orange County. And both the scope and scale of the Orange County shenanigans are remarkable. One issue in the Dekraai case is whether deputies deliberately placed him near a prized informant to elicit illegal confessions. While preparing for the penalty phase of the trial, Santa Ana assistant public defender Scott Sanders, who is defending Dekraai, discovered that a jailhouse informant who had produced damning evidence about his client had done the same thing in another case Sanders was handling. After further investigation, Sanders claimed that a branch of the Orange County Sheriff’s Department called “special handling” would deliberately place jailhouse snitches in cells next to high-value inmates awaiting trials, with instructions to collect confessions, a practice that is unconstitutional. Together with his law clerks, Sanders spent a year unearthing and then reconstructing a tranche of 60,000 pages of records indicating that the county sheriff’s office routinely used and coordinated with those informants to get around the constitutional prohibition on eliciting incriminating statements from defendants who had lawyered up and should not have been interrogated. The sheriff’s department has admitted that mistakes were made. The DA’s office claims there was nothing coordinated or systemic going on. But Judge Goethals disagreed, finding that the new revelations called into question the integrity of the entire Orange County District Attorney’s office. In an explosive moment following a hearing last year, Sanders revealed that the Orange County Sheriff’s Department has maintained a massive, secret, 25-year-old computerized record-keeping system called TRED. These TRED documents were full of potentially exculpatory data, but the agency officials had systematically refused to turn any of them over, or even acknowledge their very existence, to defense counsel. Dekraai has already pled guilty to killing eight people, so the issue in his case is whether his due process rights have been violated with respect to his sentence. His attorney, Sanders, says he should be ineligible for the death penalty because of the misconduct by the prosecution and the sheriff’s department. Judge Goethals has thus far declined to take capital punishment off the table. California Attorney General Kamala Harris’ office was supposed to have inherited the prosecution of the Dekraai case, but she has appealed Goethals’ ruling. She also announced that her office will launch an investigation into all allegations. That has elicited its own criticism, with legal experts suggesting that a truly independent investigation needs to be launched; one that recognizes that the close ties between the attorney general’s office and the DA’s office warrant a completely neutral commission. What’s wrong with using jailhouse informants? It depends on how they are used. Testimony from snitches is certainly legal—even if the informant gets rewarded with a reduced sentence or material benefits or even cold, hard cash. But evidently the Orange County informants were deliberately moved to be closer to high value targets, they taped their conversations, and the records of much of this conduct were then hidden. As Dean Erwin Chemerinsky explains, the Constitution limits the use of jailhouse informants to situations in which statements are made voluntarily to cellmates, not orchestrated and recorded by jailhouse officials, all of which makes the interaction too much like an interrogation. The 1964 Supreme Court case Massiah v. United States bars the government from eliciting incriminating statements from a defendant after the right to counsel has kicked in. In Dekraai’s case the issue was how jailhouse informant Fernando Perez found his way into a cell next to Dekraai, befriended him, and then reported hearing him “bragging” about the Seal Beach murders. It appeared that the prosecution had been the recipient of extraordinarily good luck. The inmate housed closest to Dekraai was a good listener, a great note taker, and someone so selfless that he wanted to assist the OCDA [Orange County district attorney] and local law enforcement without wishing for anything in return. OCDA Investigator Erickson’s subsequently written report confirmed this picture of Inmate F. The prosecution promised nothing in return for his assistance, which was perfect for Inmate F. because he wanted nothing. The problem for the Orange County District Attorney’s Office arose after Sanders started digging into details about Inmate F and happened upon, just for starters, a note in his file stating: “WAS TERMINATED AS A C.I. [confidential informant]—DO NOT USE AS A C.I.” as well as his colorful history of three-strikes convictions and conspiracies to murder fellow inmates. Last August, Judge Goethals ruled that prosecutors couldn’t use the Perez statements during the penalty phase of the trial, but he also found that there was no evidence of a conspiracy, just that mistakes were made. But after Sanders found the TRED records, it became clear that sheriff’s officials—not a nurse, as they had sworn, under oath—had put Perez next to Dekraai’s cell, and that the violations were likely deliberate and coordinated. The problem with the system set up in Orange County, according to Sanders, was that jailhouse informants were asked to collect incriminating statements and then share them with prosecutors in exchange for reduced charges or other favors. Last November, the Orange County Register reported that two prolific informants with extensive criminal records had received more than $150,000 from law enforcement agencies for obtaining information from jailed suspects awaiting trials. And even though snitching happens everywhere, and inmates are well aware that there are benefits to be gained for eliciting information, there are few mechanisms that exist to correct the perverse incentive to trade false information for rewards. As Moxley notes, the Los Angeles Times’ 1989 investigation, Jailhouse Snitches: Trading Lies for Freedom, exposed many of these problems. The article quoted Steve Vulpis, then an L.A. County Jail inmate, who admitted he and other informants told prosecutors anything they wanted to hear in order “to go home.” The story also quoted one informant from Orange County: “He was blunt in his assessment of courtroom shams conducted by other snitches and sponsored by the government, saying, ‘A way you can get around maybe not being able to get a confession right away [from a targeted inmate] is create one.’ ” The problem persists after all these years. In a report this week for America Tonight, Al Jazeera obtained damning tapes of likely Orange County snitches negotiating for testimony. The Dekraai case became a turning point in Orange County when Judge Goethals got mad. He found that two deputies, Ben Garcia and Seth Tunstall, who belonged to the “special handling” unit dealing with informants, testified falsely to the court, denying the very existence of the TRED records at a crucial hearing last year. He also found that a prosecutor, Eric Petersen, had testified falsely. Natapoff observes that another stunning aspect of the Orange County scandal is that a defense team was able to break through the prosecutors’ and sheriff’s office wall of silence. “Here you have longstanding collusion between the sheriff’s department and the DA’s office, and then the willingness to lie about the practice, even to the extent of committing perjury, under oath, in court to cover up those practices.” Noting that most everything about jailhouse informants happens in what she calls a “culture of secrecy,” Natapoff recalls that at the start of this case nobody would believe Sanders’ claims. He sounded like a conspiracy nut. This despite the fact that everyone knew this, or something like this, could be happening. The constitutional protections built into our criminal justice system are not perfect. But the events of the past year in Orange County reveal that the alternative—a nihilistic sense that we can do whatever we must to nail the criminals—is far more dangerous. Especially if we let the most dangerous criminals walk in exchange for snitching in trivial cases. Yet more dangerous still is our tendency to turn a blind eye on the practices that are now coming to light in Orange County. They happen in secret because not enough people want to know about them. And they will continue to happen because so many people keep trying so hard not to care.